I always look for new ways to keep my kids entertained, especially when it’s raining and they can’t get outside to play. 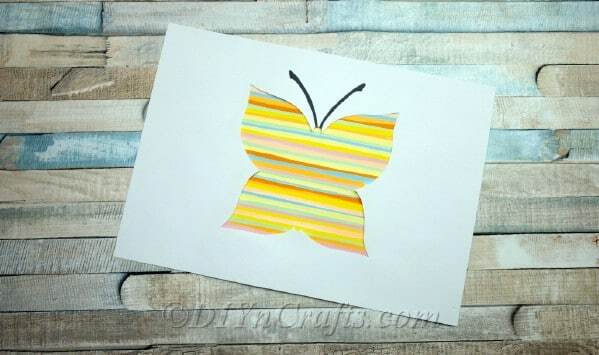 I wanted a new craft for them for spring, something that they would love to make and that maybe would take longer than just a few minutes, so this colorful spring butterfly craft was born. 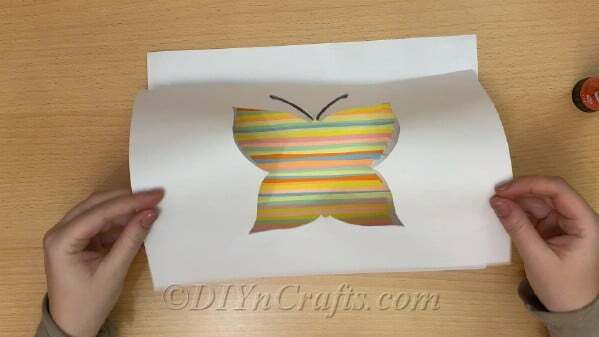 Who Can Do This Butterfly Craft? What’s Your Favorite Craft Using Colored Craft Paper? 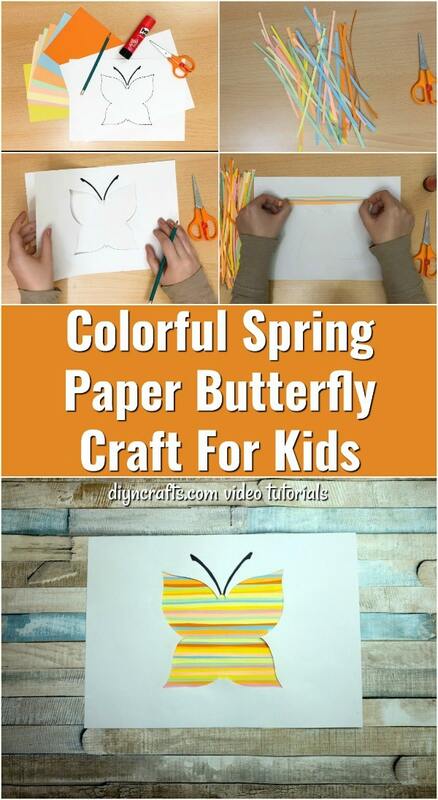 Kids of any age could do this butterfly paper craft. If you are working with toddlers or preschoolers, you may need to help them to cut the paper into strips. Even toddlers can glue the papers down on to the craft paper though, so this is a great spring garden project to teach kids about the great outdoors and nature. Printable template download link. 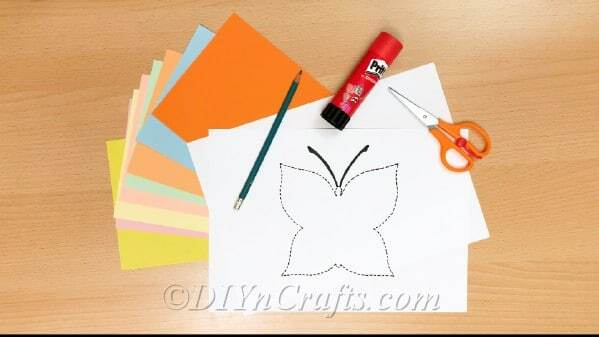 For this butterfly craft, you need the template, which you can easily print from your computer. Just click on the link and you will be taken to the template in a new window. Once in that new window, just print click. You don’t even need to have any colored ink – the template is printed in black ink and then you cut around it to expose the colored paper. This is a pretty straightforward process. First, you will want to print off the template, which you will use after you finish adding colored paper to another page. Strips of colored paper are glued onto a white sheet of craft or printer paper and then the template outlines the butterfly. It’s a really easy craft and one that your kids are going to adore. I love Easter crafts for kids! First, start by gathering up all of the craft supplies that you need. 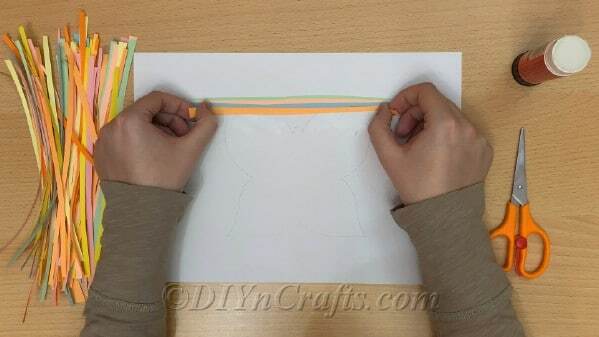 Start cutting colorful craft or construction paper into really thin strips – you should get several strips from one sheet of paper. Begin arranging the strips onto a plain white sheet of printer or craft paper. 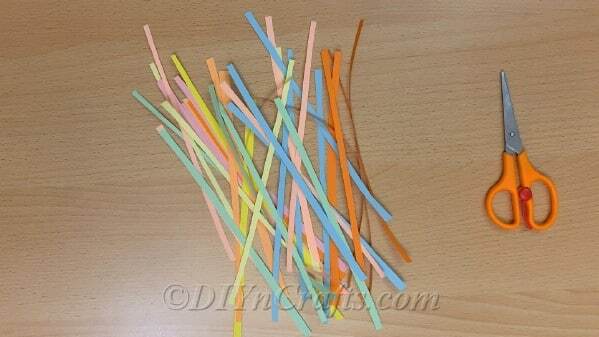 Use the glue stick to glue the colored paper strips onto the plain paper, in whatever pattern you want. 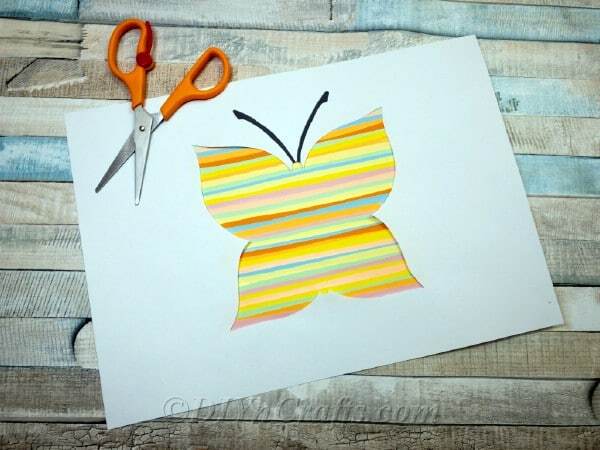 When you are finished adding all of the colored strips that you want, glue the butterfly template over the colored strips paper, making sure that the butterfly is centered and that your colored strips show through as the butterfly’s body. Frame or hang on your refrigerator!